Understanding the relationships in your knitting means you know why and how to turn one shawl shape into another. It puts more power and more control over your knitting, in your hands. The book is all about understanding this map. This map shows how shawl shapes are all interconnected. 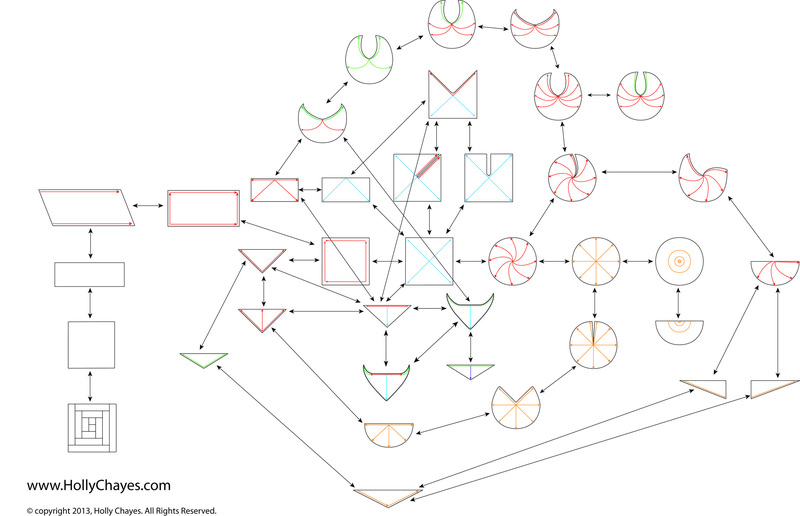 Understand the map means understanding how to get from shape A to shape B to shape C.
Shawl Geometry III: the relationships behind the numbers is the third part of the Shawl Geometry Series, and is nothing like the first two books. It’s not a book of formulas, or knitting instructions. This is a book about theory. It’s geeky, and weird, and crazypants, and totally awesome all at the same time. This book is written for people who LOVE knitting shawls and who want to understand the WHY. Shawl Geometry III lays out and explains how the 37 shapes in Shawl Geometry I & II fit together, and are built off of one another. By explaining how the shapes are all connected to each other, Shawl Geometry III demonstrates the relationships between the shapes. There are three parts to Shawl Geometry III. The map. The video. The book. The map shows how all the shapes are connected. The video shows how to go from a blank page to the map. Starting with one shape and building out from it, connecting all of the paths. The book breaks down and explains the map. Step by step. Piece by piece. It’s a 20 page PDF that explains how all the shapes are connected and how to get from shape X to shape Y to shape Z. This book assumes you have a basic understanding of how to knit shawls. If you don’t, there are plenty of resources out there to teach you step by step how to knit a shawl. But this is not one of those resources. You don’t have to have Shawl Geometry I and Shawl Geometry II, but you do have to know how to knit shawls in a variety of shapes (at least the square, right triangle, and circles). The concept is both complicated and very simple, at the same time. When you zoom in, it’s really simple. A square becomes a triangle by cutting it in half diagonally. A square becomes a rectangle by cutting it in half horizontally. When you zoom out, it starts to look complicated. The map is the zoomed out part. The book is the zoomed in part. The book breaks the map down into individual paths, and guides you down each path, stepping from shape to shape to shape. This means, you don’t need to blaze the trail and follow the path at the same time. It’s like the difference between blazing your way through a jungle, and going to a national park. Shawl Geometry III lays out the relationships between these 37 shawl shapes. It explains how they are related, and build off of one another. By walking you through these connections, step by step, Shawl Geometry III shows you how and why you can turn one shawl into another. It puts power and control over your knitting, in your hands. Plus! once you understand all the individual parts, and know the landscape inside and out, you can blaze your own paths! Bonus! But only if you really want to. Double bonus! So grab your coffee and get ready to delve into a world of shawly goodness. The adventure begins as soon as you’re ready. You don’t have to have Shawl Geometry I and Shawl Geometry II, but you do have to know how toknit shawls in a variety of shapes (at least the square, right triangle, and circles). Once you understand all the individual parts, and know the landscape inside and out, you can make your own connections, and make you own shapes.